1. The Game of Thrones books are invading middle and high schools, giving YA fantasy permission to get more complicated. Fantasy books for broad teen audiences have traditionally tried to keep the fantasy world simple under the understandably misguided assumption that YA readers don’t want to have a character tree and a map in front of them in order to keep all of the action straight. Teen readers are twisting this logic up in knots — big, complicated, fantasy-plot knots. During last school year, the only library patrons who ever asked me about the Game of Thrones books were teachers. This year, five different students asked me for them in the first two weeks of school alone, and they ranged in age from 13 to 18. This trickle-down interest from the HBO series is a game-changer for YA fantasy. We should expect increased teen interest in Game of Thrones over the next few years, and I suspect that publishers are already starting to invest in similarly complicated fantasy series for teens. Just last week, I saw a teen book mentioned in a review journal as a Game of Thrones read alike, and I suspect many more will soon follow. 2. 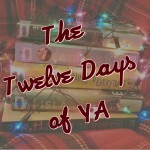 Kristin Cashore is still having ripple effects, creating new pools of character-driven YA fantasy. When Kristin Cashore’s Graceling was published in 2008, it was a trumpet call, bringing new readers to the genre. 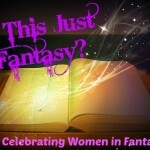 Her books veer away from the plot-driven, world-building style of fantasy and instead read almost like realistic fiction with their close focus on characters and their inner struggles. Other writers have followed suit in recent years. 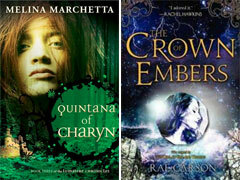 YA veteran Melina Marchetta has taken her ample realistic fiction skills and applied them to the Lumatere Chronicles — her fantasy series that started in 2010 and will continue next year with the third book, Quintana of Cheryn. And newcomer Rae Carson hit it out of the park last year with her fantasy series starter The Girl of Fire and Thorns, which now has a sequel, Crown of Thorns. 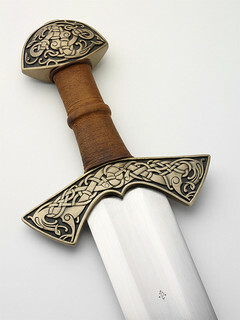 We should definitely expect to see more character-focused fantasy adventure tales in the next few years. 3. 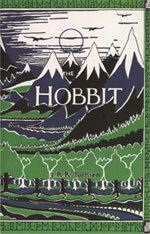 The movie adaptation of The Hobbit is on its way, and publishers are cashing in by repackaging fantasy classics. Movie tie-in editions of The Hobbit are certainly making their way onto bookstore shelves in preparation for the film’s December 14 release. But the movie-poster cover isn’t the only one you’ll be seeing. The publisher has also re-released the book with its original, classic cover. And The Hobbitisn’t the only book making its way into new displays. 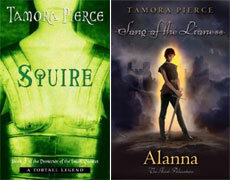 Titles by Ursula Le Guin and Tamora Pierce have also been getting recent makeovers. Graphia Books just rereleased Le Guin’s Earthsea Cycle series with a set of beautiful covers that make the books look brand new. Random House just restyled Tamora Pierce’s Protector of the Small Series with modern, abstract covers that are hard and hip — and worlds away from the little girl in a bowl cut that used to sell copies. And Atheneum Books took on a rebranding of Pierce’s Alanna series, which now has a startling and refreshing absence of pink. All these makeovers should translate into a new generation of fans for some of these fantastic fantasy veterans. 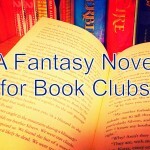 The bottom line is that fantasy is hip again, and we’re likely going to see a surge of interest in both fantasy classics and contemporary series in the coming months that will lead more authors and publishers back to the genre. Personally, I can’t wait.